In 2005, my partner and I took a course in Cuernavaca, Mexico. It was FABULOUS! I highly suggest it for anyone. We had a great group of people who got along so well. We were taught by a professor who is also a friend of mine. I was one of three men on the trip (and my partner was another man). We had so much fun. One of the best parts was that we stayed in home stays. Richard and I stayed with a lovely couple, Carlos and Luis. Their house was filled with art (a lot of inappropriate art, now that I think of it). Luis was a chef, and taught a lot of cooking classes to visitors. Together, they started up an organization called CD4, which was an HIV/AIDS awareness campaign. They were such a fun couple. We didn't speak Spanish (still can't, really), and their English was marginal, but we had so much fun laughing together. I just got an email that Carlos died. This is very unexpected and shocking. I got a lot of details about the celebration over his life. They partied, just as Carlos wanted. That's what the email said..."just as he wanted". I didn't know that Carlos was sick. On one hand, it sounded expected. I only have a few people I can call about this, but it just saddens me to know that someone who was so full of life is no longer with us. Carlos was SO FUNNY. All my classmates told me that we lucked out so much by having him as our hosts. One night, we went with him as he prepared to participate in a drag show. He was with a serious drag queen (who loved to perform). She didn't appreciate how lightly he took his job as a drag queen. She wanted him to choreograph something, while Carlos just wanted to look stupid. He also was refusing to shave off his mustache. Luis' father died a little over a year ago, and we sent a note then. I feel bad that he is all alone right now. I hope he's doing well. This is our group in Mexico. Richard and I are on the left, and Luis is on the far right. Carlos is right behind him. I have been a part of a lot of conversations about diversity in the past couple of months. It is coming up at church. It is coming up at my college. It's coming up with organizations of which I am a part. I like diversity! Really, I do. I guess that my struggle is how to "do" diversity in a way that is genuine and keeps integrity. I've been trying to make a case lately that it is possible, even necessary, to hold both a Lutheran theology and a value for diversity. The problem is that I'm not a good enough theologian to be able to do that...at least not very well. My other problem with diversity is that is often feel tokenistic. I don't want to ever tell someone, "Oh, I have a black friend." However, I know that it takes some intentionality for me to reach out to someone who is unlike me. I feel like I have to be tokenistic to get to a deeper and truer relationship. Of course, as a gay man, I know that I contribute to "diversity" as a concept. However, I am also still aware that even as a gay man, I get all the privilege of being both white and male. I can hide my sexual orientation if I need to (I don't often need to), but I cannot hide being white or male. I feel like one of those people who says that he supports diversity, but in reality still associates with people just like himself. I'm not sure if you have dealt with this at all, but any feedback is appreciated. I have agreed to do pulpit supply this Sunday at J's church. I like to preach every so often, but lately, I've had a ton of invitations to preach. When it rains, it pours. I've been struggling to figure out how to not make this sermon a depressing rant. Frankly, when I saw the assigned texts for this Sunday, I was not impressed. I was reading it in a way that dwells on death and destruction...not very Easter-y. By this point, I think I've worked some Gospel in there (a necessary ingredient). We'll see what they think. Fortunately, I still have a day to dwell on it, so I can tweak it even more. How do you people do this every week? Oh, and by "you people", I mean our clergy friends who read this. It must be hard to keep the message fresh. I have a new appreciation for the work you do! I got a haircut the other night. We often switch between Great Clips and Fantastic Sam's. This time, we opted for Fantastic Sam's, because of their close proximity to a Dairy Queen. I always dislike the question, "What do you want to do?" I never know how to answer that. I'm not the hair expert. I guess if I went to a fancy-schmancy salon, they would be telling me what I should do. However, I've sort-of learned how to respond. Often, I start off with the joke, "Make me look hot!". That can get a laugh. I often follow up later in the haircut with, "Oh, and can you go through and pluck out the gray hairs." This evening, however, I didn't get to my second joke. I had just sat down and laid out my first "Make me look hot!" comment, when she pre-empted my "gray hair" joke. Here's what she said: "I see we are rockin' the salt and pepper." I can make jokes about my gray(ing) hair, but you can't! I realize that this was a ploy to get me to buy into hair coloring, but I was not amused. I also didn't buy into the hair coloring. At the end, she also convinced me to shave (trim?) my eyebrows. This is not something I've thought of before. In fact, I like my eyebrows to be full because they help with my facial expressions. I told her as much...she wasn't impressed. Now I have these eyebrows that look really dark in toward the center, but the outer parts are barely visible. I'm not sure how I feel about this. Anyway, there's a recap of what my haircut experience was like. Enjoy! By all accounts, our fund raising weekend went well. We haven't gotten the money from Friday and Sunday (they are putting all the cash into one check for us). But on Saturday, we got $570. I also went to the MCC church in town, and they presented me with a check for $1300. They had been collecting money for the month of March for The Naming Project. $1300 is about half of our camp budget, so we are doing well this year! I think that people are starting to know what The Naming Project is. It feels easier this year than it has in the past. That's good, because I feel like I have less time to dedicate to TNP than I have in the past. I long for a day, when we can be established and not have to feel like a start-up all the time. I haven't talked about Camp Out, the documentary about The Naming Project Summer Camp, lately. To be honest, we are still waiting for Camp Out to come out on DVD. It's been such a long wait, I'm quite frustrated. I feel like this process is dragging on painfully slowly. Every time I talk about the film, I get asked when it's coming out. I think there is a big audience, but it's shrinking with every passing day. I especially get frustrated with documentaries like For the Bible Tells Me So get a major theater distribution and a DVD release within such a short amount of time. It's hard not to compare our film to others. Essentially, I did the same thing with Jesus Camp, since it came out at the same time as Camp Out. Well, here's a bright spot for those of you in the greater Twin Cities area (or who want to travel there). 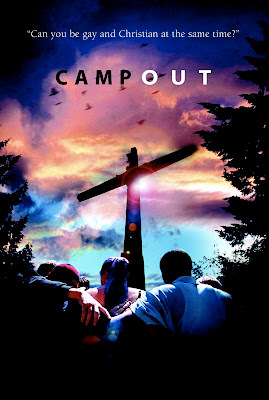 Camp Out is showing this Friday and Saturday. The film showings are fund-raisers for The Naming Project Summer Camp. We have a showing this Friday at 7:00 at the First Unitarian Society (900 Mt. Curve Ave in Minneapolis) and a showing at 7:00 at St. Luke Presbyterian Church (3121 Groveland School Road in Minnetonka). There is also some discussion and conversation happening on Sunday morning, April 13 at the First Unitarian Society. If you are in the area, please stop by to see the film and say hi. I'd love to see you. I just saw that Charlton Heston died at his home last night. I guess now we can take that gun out of his hands. This week has not been much of a rest. I guess I can assume that no week is really going to be a restful week. I've been playing catch-up ever since I got back. I'm dealt with budgets and accounting (you know how much I love that). There is just too much!